Villa Luna is for rent in the luxury resort Vale do Lobo (Algarve) within walking distance to the beach club Praca and the beach (5 min.). Lovely holiday villa for 8 with air conditioning, private pool, WiFi internet and amazing sea view! 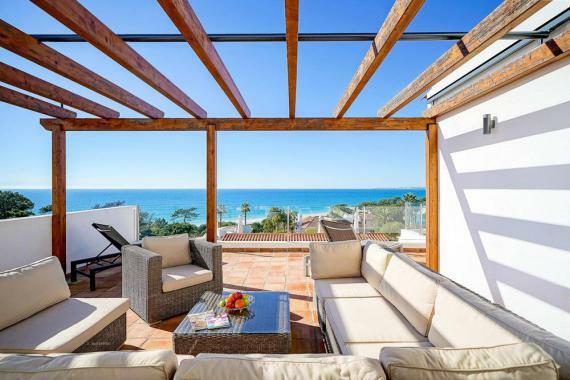 This lovely holiday villa is located in the luxury resort Vale do Lobo (Algarve) with golf courses, tennis courts, restaurants and shops. Villa Luna lies within walking distance to the beach (5 min) and comprises two floors. On the ground floor there is a spacious living/dining room with fire place and satellite TV, a fully equipped modern kitchen with breakfast bar and 2 twin bedrooms, sharing a bathroom. The living area opens onto to the pool terrace with sun beds and dining area with BBQ. On the first floor there are 2 double bedroom, each with en suite bathroom. These bedrooms share a lovely terrace with seating area and breath taking sea view. Villa Luna is located in Vale do Lobo in the Algarve (Portugal) close to golf courses and only 5 min. from the beach. It is a 5 min. drive to Almancil, 30 min. to Faro airport. Maid service once a week Towel and bed linen change once a week.